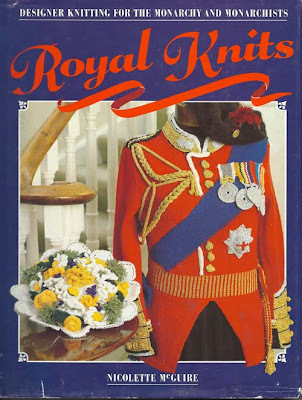 There's been lots of talk these days about Fiona Goble's cute book, Knit Your Own Royal Wedding, but it's not the first Royal book. Back in 1987 Nicolette McGuire's book, Royal Knits, was published. With it, you can make something to wear for yourself. I don't remember where I bought this book. As a matter of fact, I don't even remember buying the book. From the condition of the paper dust jacket, I'm guessing that I bought it in a used book store. The rest of the book is in good condition. Check out the Commander-in-Chief jacket on the cover. The pattern also includes instructions for the medals and braids. I wonder who would put this much work, not to mention time and money, into making this. It might be the ideal thing to wear while watching the wedding (wedding? is there a wedding somewhere?!!) on TV, knitting and sipping a fine cup of Earl Grey served in a William and Kate commemorative cup. Inside, there are more treasures for your favorite monarchist: St. Edward's Crown (which can double as a tea cozy), the Sword of State and the Orb. But wait, there's more! Why not come back tomorow to see more from this knitting book? This will give you time to go through your stash to gather the yarns. You know you want to make a crown to wear around the house while you're vacuuming or washing the dishes!! 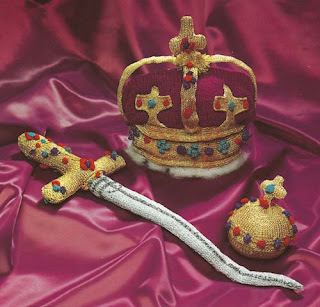 I love that knitted crown!